I love a road trip, so when a few weeks ago the Virginia Tourism Board invited me down to explore a little pocket of their beautiful state I couldn't say no. It all started with dinner at the James Beard House that celebrated Virginia's food and wine scene with a handful of Virginia's chefs, each representing their region. I may or may not have eaten my weight in the perfect oysters they served that night. Then a few days later Pete, Arlo the dog, and I packed up a car and headed down to Virginia to explore and enjoy some time out of the city. We were excited and apprehensive about the our first road trip with Arlo, but he was such a champ in the car and didn't destroy anything in the hotel rooms, ha! Early October was such a nice time to visit too. The air was still a little warm, but cool at night and the leaves were just starting to change colors. We had such a nice time, and ate so much good food - check out the links below to see where we went! We arrived in Charlottesville after a 9 hour (due to lots of puppy stops) drive and checked into the The Graduate which was cozy, comfortable, and dog friendly. The lobby coffee shop also served la Colombe, which was a big A+ Lots of the staff smiled warmly at our pup and asked to pet him which made us feel at ease right away, and Arlo loved sprinting down the carpeted hallways - something he doesn't get to do at home because our floors are too slippery :) - and walking through the UVA campus. We wandered around Charlottesville the next morning and found ourselves at Three Penny Cafe where the benedicts come with local duck eggs (!) and they serve delicious pastries from Marie Bette. The sticky bun we had was so good I made Pete walk to the bakery with me, right after breakfast, so we could try some more treats. That afternoon we met up with Adrianna, Claire, and their dudes then headed to Free Union Grass Farm for a dinner hosted by Outstanding in the Field. I have always wanted to attend a dinner at their long table, and it did not disappoint. The food and wine were incredible, the setting beautiful, and the company wonderful. The main course was a beef shank, which, well if you haven't seen before is a sight to behold. We also got to tour the farm and learn about their farming practices which was a great way to start the evening. Pete and the pup couldn't come to the farm so we went for a late night snack and drink at Oakhart Social when I got back to Charlottesville. On the way out of town we grabbed some biscuits from JM Stock (fluffy biscuit, tasso ham, hot honey, butter, heaven) to-go, and I picked up a bottle of the Potter's Farmhouse Cider that we were all obsessed with at dinner the night before. We walked around the Downtown Mall for a bit then hit the road to our next stop - Richmond! 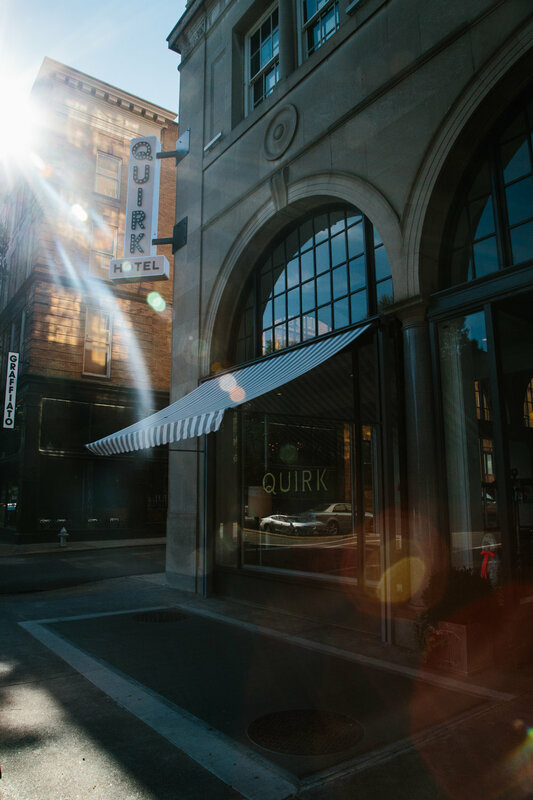 We stayed at the Quirk Hotel which was so wonderful! 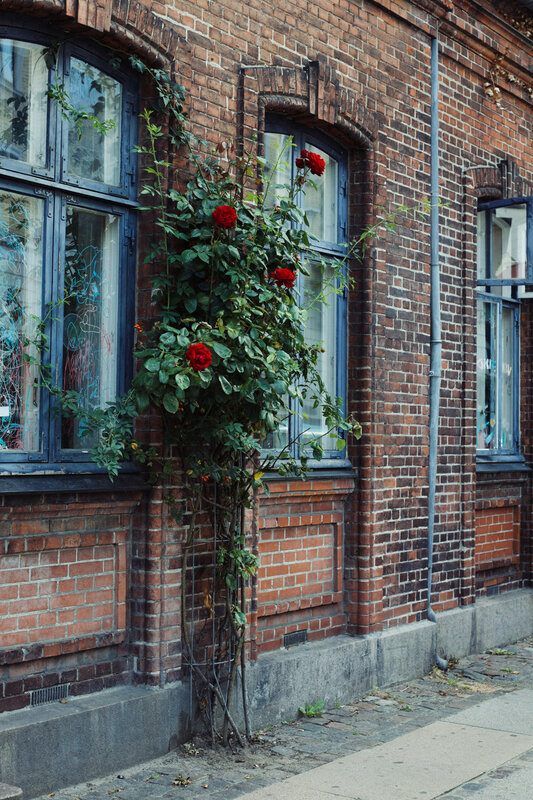 They have an art gallery and cute little shop next door, great restaurant, roof top bar, and everything is beautifully and thoughtfully designed. Even the coffee cups were seriously gorgeous. The lobby was also super cozy and inviting, it was such a nice place to hang and have coffee in the morning and a drink in the evening. Saison Market - Coffee in the morning and frozen Negronis and fried chicken sandwiches and tacos in the afternoon, yes please and thank you very much! JM Stock - (again!) We stopped into their Richmond location in the Fan to grab some snacks before wandering Belle Isle for the afternoon. No biscuits this time though :) but only because we had Early Bird Biscuit Co. on the docket for the next morning. I had the special sandwich which was "loaded baked potato" and Pete had a biscuit with gravy. It was ridiculously good in that "stays with you all day" kind of way. Rappahanock - We had the pup with us so we ate on the patio next door to the main restaurant which serves limited menu, and the seafood was totally delicious. We had a pile of peel and eat shrimp, some good and funky east coast oysters, ceviche, caviar, and some great locally brewed beers . Maple and Pine - (in Quirk Hotel) We indulged in a little room service breakfast one morning - one of my favorite things to do when traveling - and the food from Maple and Pine was great. The yogurt parfait had verjus sorbet on top, so fancy! Rooftop bar at the Quirk - Great cocktails and bar snacks with the best rooftop view of Richmond. CanCan Brasserie - A fun, casual spot in Carytown with solid classic bistro food and a great patio for people watching. We closed the place down talking to the servers about dogs, haha. Subrosa Bakery - We didn't actually make it here, not enough time :( but we enjoyed their bread at a couple of restaurants and wish we had! We stopped at Hollin Farms on our way back to NYC, and I am SO glad we did. It was the most beautiful farm on a little hilltop with a gorgeous pick-your-own pumpkin patch and apple orchard. They also had dig your own peanuts! and potatoes, and some greens too. Another thing worth mentioning is that they use Integrated Pest Management in their fields which makes me feel much better about eating fruit straight from the trees. I can't say enough good things about this trip. I was just so impressed and surprised by Virginia's commitment to really celebrate their farmers and heritage cuisine. Just about every place we visited made some reference to where their produce and meat was coming from - not in an over the top Portlandia kind of way, but rather in a subtle proud way that these are all of the things our beautiful state has to offer. We had the pup with us, and honestly were only slightly limited in the spots we could eat. It seemed like every restaurant had a dog friendly patio and the weather was warm enough to hang outside which was so nice! Disclosure: Thank you so much to Virginia Tourism for inviting us to explore your beautiful state - travel expenses, meals, and accommodations were provided by Virginia Tourism. Opinions are my own and I would absolutely recommend visiting this beautiful state. We had such a wonderful time!